This is the last of the recipes from our Soy Vay House Party I’ll be sharing. These are a super simple use of teriyaki sauce, but I really loved the Soy Vay Teriyaki on these! I chose such an easy dish for the party because we were out at a street fair for most of the afternoon – I set up the marinade before we left and then came home, threaded the kebabs and cooked. It worked perfectly! Now that we’re officially, unofficially into the summer season, easy grilled dinners like this will be in our regular rotation. I’m sure these will be making repeat appearances this summer! In a large bowl, toss together the beef and teriyaki sauce. Refrigerate and let marinade for about 4 hours. 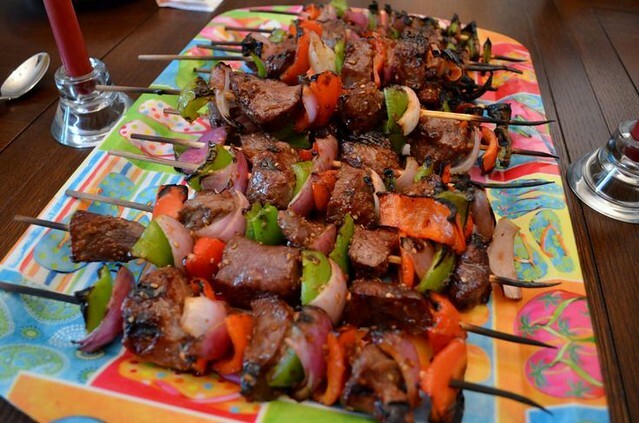 While the beef is marinade, soak your wooden kebab skewers in salted water to prevent them burning on the grill. Chop the peppers and onion into large pieces. Toss them with the olive oil.